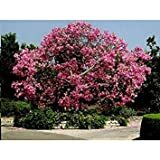 Ceiba speciosa growing tree of the genus Ceiba also known as Floss silk tree, Ceiba speciosa perennial deciduous used as ornamental attract pollinator plant or bonsai, can grow in subtropics, tropics or mediterranean climate and growing hardiness zone 10+. Trunk color is brown and can be with thorns, the trunk mostly in bottle shape. Flower color pink with inner yellow, flowers have five petals. Fruit color green and when ready brown the fruit contain like white cotton.